Summary. Gibril Gottor is a Sierra Leone journalist who has continually suffered slander, threats, and arrests, as well as assaults so brutal that he has had to be hospitalized at least twice. Gottor contributes reports on the radio and in print, focusing on government corruption and military malfeasance. As a result, military personnel have beaten him up and government officials have fabricated lies in order to keep him from his reporting. Profile. Gibril Gottor was just doing his job. It was 2007, the Sierra Leone People’s Party was governing, and Gottor, a young journalist, had reported a story on the radio alleging government officials syphoning off funds meant for a community project. A local politician didn’t like the story, called for Gottor’s “unconditional expulsion” from the radio, and threatened him, including in calls to Gottor’s home. But Gottor’s rocky career was only beginning. He soon understood that reporting the facts had its risks—particularly when those facts concern corruption. “Most of these times,” says Gottor, “and during the course of my work, I have been faced with . . . many challenges, threats, and persecutions.” He kept at it. In 2015, Gottor published a piece about soldiers going without food, shelter, water, and soap while fighting the Ebola virus outbreak. He had tried to interview the soldiers’ commander about these shortcomings but was rejected. After the piece came out, he was accused of lying and spent three weeks in jail. He later appealed his conviction, which was overturned. Shortly after the court decision, Gottor was ambushed by military personnel and beaten so severely that he had to be hospitalized. More arrests have followed, along with more slanders, threats, and assaults—all after Gottor has published stories implicating government officials in illegal activities, for example, customs officers contributing to a smuggling syndicate, helping individuals evade tax at the Gbalamuya customs post, the country’s third largest customs revenue source. Gottor continues his reporting—and his enemies have continued their assaults, not appreciating Gottor’s commitment to his job, which has carried him through all these crises and will no doubt support him in the future. In 2016, Gottor was attacked at his home by military personnel, left unconscious, and again hospitalized. His brave work is noticed. 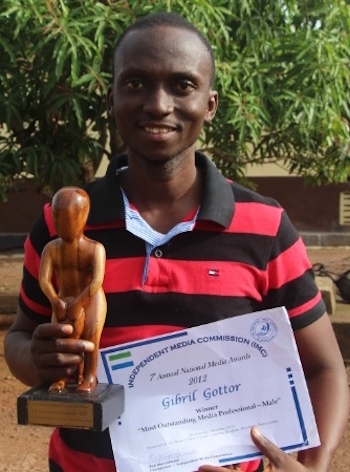 Gottor was awarded the ‘Most Fearless Media Practitioner” award for 2010 by the Sierra Leone Association of Journalists and in 2012 was named “the most outstanding male journalist” in Sierra Leone by the nation’s Independent Media Commission.